Almost as ubiquitous as the silver ARP badge, the ARP whistle was standard issue to air raid wardens prior and during WW2. It is thought approximately 1.5 million of the three-inch-long cylindrical ARP-engraved whistles were produced. Ironically, the Hudson factory in Birmingham suffered extensive damage during a German air raid on 26 October 1940. Thankfully, no one was injured. From the late 1880s Hudson’s had become the pre-eminent supplier of whistles to police forces, the military, railways and sports clubs across the British Empire. The company is still running today but now known as ACME Whistles (and still located in Birmingham). Initially the Home Office and the Treasury (responsible for the Air Raid Precautions budget) conferred on the cost of allocating an ARP whistle to every warden. The Treasury wanted whistles to be shared and stored at Wardens’ Posts (June 1939 HO 186/1788). For hygiene reasons though whistles were given to every warden and also to other civil defence services such as Rescue Squads and Fire Guards / Fire Watchers. When air raids are threatened, warning will be given in towns by sirens or hooters, which will be sounded, in some places by short blasts, and in other places by a warbling note, changing every few seconds. In war, sirens and hooters will not be used for any other purpose than this. The warning may also be given by the Police or Air Raid Wardens blowing short blasts on whistles. When you hear the warning, take cover at once. There is some debate about whether the ARP whistle was manufactured slightly differently to the standard police whistle to produce a different tone. The reasoning given was to ensure that the police could hear the difference and know that the call was not from another police officer requiring assistance. Personally, I’m not sure this was the case and am looking for any evidence to prove this point of conjecture. A private purchase ARP whistle for civilians. The ARP whistle was made with a ring at one end through which a chain or lanyard could be attached. 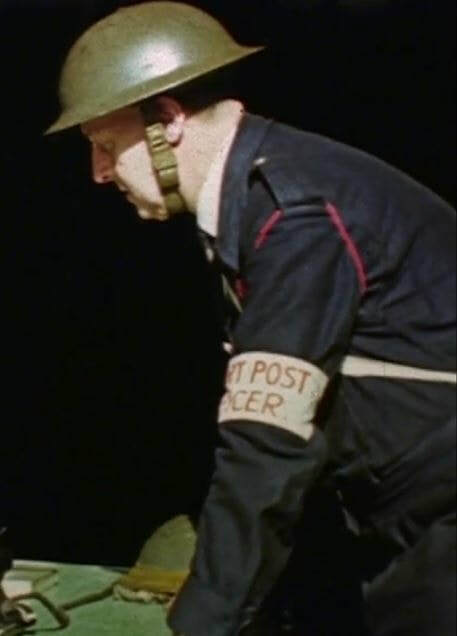 Prior to the outbreak of war, air raid wardens were not issued with any form of uniform. It probably follows that they either used a chain similar to that issued to the police (which could be looped through a button hole) or carried the whistle loose in their pocket. 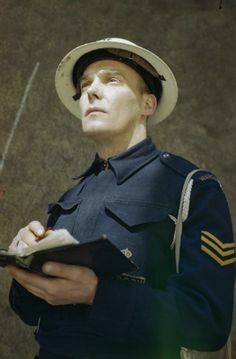 At the start of the war, when bluette overalls were issued to wardens, a lanyard was often attached which looped over the shoulder and the whistle was then placed in a breast pocket. With the introduction of the battledress and tunic uniforms from late 1941 the vast majority of wardens and civil defence personnel bought a lanyard for their whistle (generally coloured white in London and ‘old gold’ yellow elsewhere but red ones are known to have been used). Lanyards were not an item that was issued and had to be purchased privately. As the majority of people were right handed this was on the left shoulder but photographic evidence on period photos shows the lanyard also worn on the right shoulder. The white lanyard worn over the left shoulder was found in London. 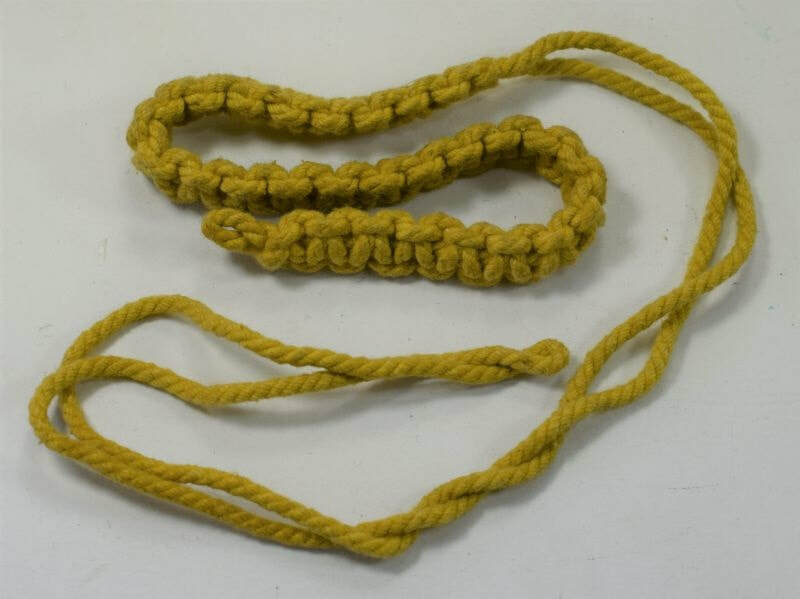 WW2 ARP Warden and Civil Defence Yellow Shoulder Lanyard. WW2 ARP Warden and Civil Defence White Shoulder Lanyard.